The theme chosen by the Endeavourers for this quarter was Improv. Probably everyone has their own idea about what improv means in quilting terms. In general terms it means "to create spontaneously without preparation, or to produce or make something from whatever is available." Anyway, thinking about the two definitions I started with the idea of producing something from whatever was available. I thought that this suggests making the most of limited options so rather than pick and choose from my stash I artificially limited the options by choosing to use a pile of small pieces of interiors fabric (possibly linen shot with silk) from a sample book I picked up in a remnant bin. Then I tried to be spontaneous! First, I spent a lot of time thinking how to be spontaneous.... Then I worked out a plan for spontaneity... I decided to make piles of samples and cut them stack and slash style. Then I mixed them up prior to sewing them back together. I tried to be random but couldn't help making a few changes when too many pieces of the same colour or tone ended up together. Having pieced my blocks I spread them out randomly, but again I had to make a few changes because I wanted to have an even distribution of colours and tones, without any distracting clumps. Because I cut the piles in different ways, some of the blocks turned out a slightly different size from the others, but I didn't trim them down - yay, spontaneity. As I joined the blocks into the quilt I threw some gold fabric into the mix, but I think this was less spontaneity and more obsessive tweaking. The quilt was very insistent that it wanted organic (spontaneous) pinstripe quilting in Aurifil wool, but unfortunately it only made its mind up about this once I had already quilted in the ditch, so I had to do a lot of unpicking and I'm still not convinced the quilt was right. I did enjoy making it, and it was fun trying not to overthink things, though it somehow took a very long time. I do wish I'd been more adventurous. Setting the personal challenge of using the sample book fabrics limited the options a bit and this theme has made me think about future experiments where I had more materials to choose from. I think the idea of improv suggests that the results are random but in fact that's not really the case. In (successful) improv comedy nobody just stands and shouts random words. There's usually some underlying structure, like a chord progression in improv jazz, that makes sense of the result. 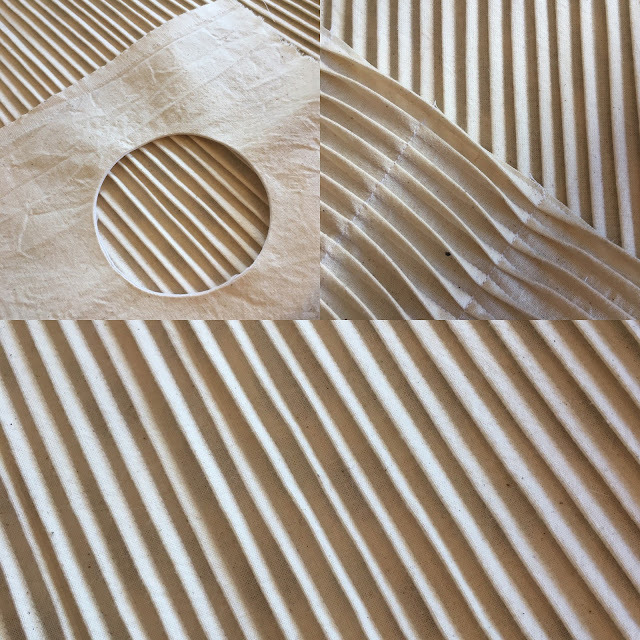 In quilting you actually have to get your pieces to fit together into quilt form, and aesthetic considerations mean that you might be spontaneous only up to a point. I'm looking forward to seeing how the other members of the group treated the theme. You can find us all together on the blog, where there are also links to each individual member. Today is the reveal of quilts made for the third quarterly challenge of The Endeavourers quilt group. You can find all our quilts displayed on The Endeavourers blog, and there are links to each individual member. Our challenge for this quarter was 'Spiral'. The path of a point in a plane moving around a central point while continuously receding from or approaching it. A three-dimensional curve (such as a helix) with one or more turns about an axis. When Mr Random Number Generator picked this theme from our hat I was momentarily stumped but I got completely fascinated by it. There seems to be something which is universally satisfying about the shape of spirals and they have featured for thousands of years in art and decoration from the neolithic period onwards; for example there are spirals in neolithic rock art in Scotland. In some cultures the spiral represents the sun, and by association the passage of time. It has been used to decorate early tombs and so is associated with the cycle of life and death, and it is found on stone carvings of the mother goddess as a symbol representing the cycles of fertility, creation and birth and cosmic forces. 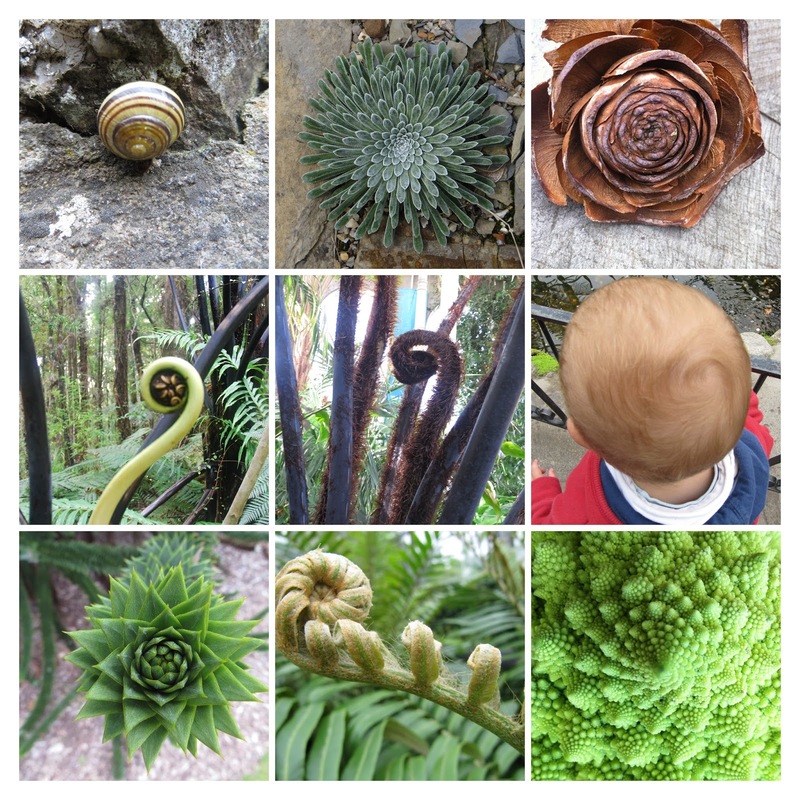 Spirals feature in nature - from DNA to spiral galaxies, in the arrangement of leaves on a plant, and in the growth of cones, horns and shells, Mathematicians are interested in the properties of spirals, and engineers and architects make use of them. As usual my thoughts went off in a number of directions and gradually came back together in a plan towards the end of the quarter when I was on holiday in Robin Hood's Bay on the North Yorkshire coast. My quilt is all about spirals in nature, as represented in a view of Robin Hood's Bay. The quilt shows a view of the cliffs on that coast, as glimpsed through some of the local plants. A convolvulus or bindweed climbs up a stem, in a spiral helix, and its buds furl and unfurl in spiral form. There are two snails with their spiral shells, and and an ammonite from the cliffs - a long extinct fossil sea creature also with a spiral shell. Robin Hood's Bay is an area with a dynamic geological history, so it also really encapsulated for me the forces of creation and the passage of time which have come to be symbolised by the spiral. Just after I'd made a plan I read that the spiral is a symbol of the pantheist movement, which celebrates the power, beauty and mystery of nature and the Universe. This made me happy! I wanted to take a painterly approach to the quilt so as well as applique, hand and machine embroidery, I used watercolour paints to add a wash to the silk used to make the sea, to add details to the shells and ammonite and to add colour to some of the quilted pebbles. Binding is faced, with the bottom edge being cut in a curve. Since I first discovered and started reading craft blogs one of my favourites has been Carina's Craftblog, for her engaging writing style and for colourful photographs of inspiring projects (plus occasional pics of Blake the dog!). If you are familiar with Carina's blog too, or follow her on instagram, you'll know that she designs and sells pretty, imaginitive and quirky embroidery patterns and that she is the author of Mandalas to Embroider and a new book Folk Art Embroidery to be published in September. Now in a slight departure she's published an ebook in which embroidery and applique feature as the embellishment on different sewing projects. 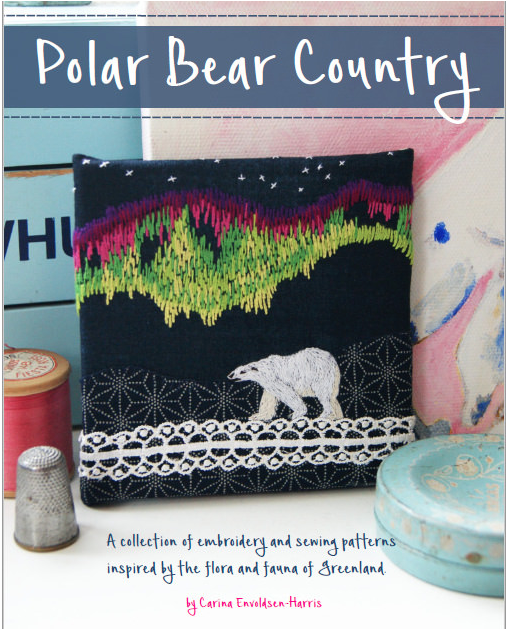 The book is called Polar Bear Country and it is inspired by her fascination with Greenland and manages to combine her fondness for polar bears and other arctic fauna with her love of flowers! There are thirteen projects in the book which makes the price (£16) seem very reasonable. These include a variety of both pretty and practical items, two quilt tops, and as a bonus, there's even a cupcake recipe. There are three sections - first there are pictures of all the projects together with detailed instructions on how to make them. The second section has instructions for embroidery stitches, and tutorials for techniques you will need in more than one project. The third section has templates which can be printed out (and as they are at the right size you don't need to faff around with enlarging or taping pattern parts together). This all means that you have everything you need to know in order to get making - the only thing not included is instructions for finishing the quilt tops into quilts, since many people have their preferred way of doing this and if not it's easy to find instructions online. I love the chatty and encouraging way in which this book is written - it's liberating to read a 'pep talk' telling you that wonky embroidery adds personality to your work, and that mistakes aren't a big deal in the grand scheme of things! It's also good to know when you can omit a step 'if you can't be bothered'! The projects are very adaptable and can easily be modified to suit your needs - for example you could enlarge the applique pattern for a whale tail brooch and use it to make a cushion instead, or put different templates together in a number of ways. Some applique templates have additional details so that they may also be used as embroidery patterns. The different projects also lend themselves to a range of different levels of ability or ambition and would appeal to both a developing beginner and a more advanced sewer who likes to add their own spin, and they are very charming! These qualities might also appeal to someone like me who would like to do some parent-child bonding over a shared craft project. 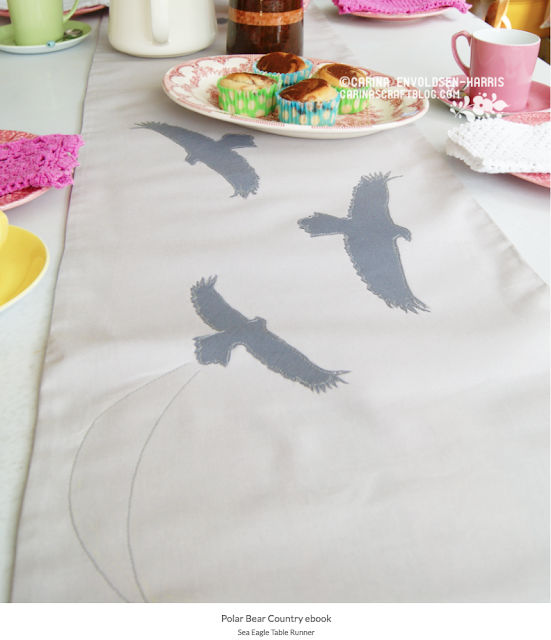 I'm planning to do just this and make the sea eagle table runner with my daughter as a present for a friend who particularly loves these birds (watch this space). 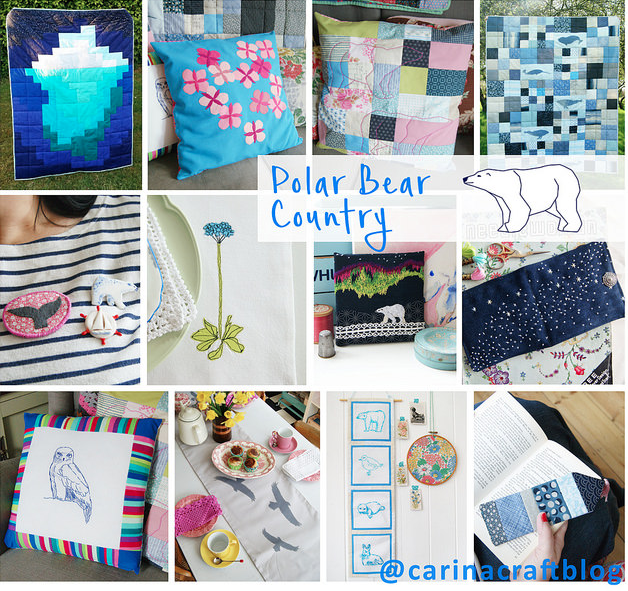 You can buy Polar Bear Country here if you are in the UK/EU and here if you're outside. Disclaimer: I received no remuneration for this article other than a free copy of the book for review and the opinions in this article are my own. Today is the day that The Endeavourers art quilt group reveal our second quilts. This quarter's theme was Change or Transformation. As usual it was a very thought-provoking theme! The fact that it was thrown into the hat by four of our group was interesting in itself. I guess that this subject has a lot of personal resonance. So my first thought was about change from the point of view of an individual human. I also thought about the way that as we get older we become more layered - it would have been interesting to represent that in quilting. Then I thought about change, especially transformation, in nature. The transformation from caterpillar to chrysalis to butterfly for example, or from seed to plant - which is always on my mind as I sometimes work as a gardener. Transformation suggests a transition into something completely new, which would have been an interesting line of thought to follow, but then I started to think about change as cyclical. Change and transformation can be positive or negative, but some change is just part of the ebb and flow of life, neither good nor bad. Anyway...this takes me to the background to my quilt. When we were lucky enough to travel in New Zealand a while back we went to visit the Kauri forest in North Island. The trees there are almost inconceivably old and huge, and convey a sense of stillness (like columns in a cathedral) that fills you with awe, while life goes on about them. In contrast to this stillness tiny humans scurry around, and other vegetation moves in the breeze, like speeded up events in a time-lapse film. Some of these trees may be over 2000 years old, and they have just quietly stood there while many many changes have taken place in the world. Closer to home and on a very much smaller scale, trees live through the cycle of the seasons. This cyclical change was what I chose to represent in my little quilt. This change is neither good nor bad, it's just part of the flow. As the seasons pass, the sun moves across the sky and sinks lower in the horizon. The leaves on the trees change colour and finally blow away, turning into birds who fly away in winter, only to return in the spring and begin the cycle of change again. As the sun moves across the quilt it follows (nearly) a sine wave - I think there's something aesthetically pleasing about this shape and in the quilt it is there to reinforce the idea of a repeating pattern. My trees are birches, which I think are very beautiful and textural. (You can see my other quilt about birch trees here.) I didn't want to fill the quilt with leaves as there is already a lot going on, and so I suggested the leaves with triangles, trying to capture the fractured and angular patterns of light you get when you look up through their rather sparse canopies. The background is made using curved piecing which is densely quilted, leaves and birds are fused applique and the trees and suns are hand-sewn turned applique. I added hand embroidery in thick perle cotton round the suns. Materials are almost entirely shot cotton, with silk for the trees. You can see all our quilts 'exhibited' together on our blog The Endeavourers, where you'll also find links to each individual member. Please do have a look! I seem to be coming out of the winter period of creative inactivity, which is just as well as the deadline is approaching for the latest mini hoop swap hosted by Ali. I love taking part in these swaps, both for hoops and Artist Trading Cards, because of the challenge involved in making something very tiny, though there is always a period of fear when I wonder whether it's going to be a disaster. After that it's just fun to play and I usually end up making more than one. Then I was having so much fun, I did a bit more curved piecing and started on another piece with tiny embroidered palm trees, a sequin sun, some whispy clouds and a funny little mutant whale. There was a pause until the hoop I'd ordered arrived, and when it did, I looked at it and suddenly thought "Porthole!!" These little hoops (by Dandelyne) are only 5.5 cm across, with the space in the middle being even smaller of course, but making one seems to take just as much thought and effort as much bigger projects so you always desperately hope that your partner will like the result. See what I mean about tiny! I have an idea about which my partner might prefer, I won't let on which, but it will be winging its way to her.